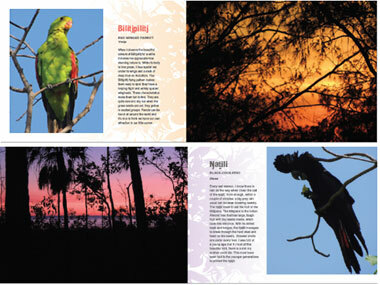 Young photographer, Siena Ganambarr Stubbs, has published a book featuring photographs that she has taken of birds in the North-east Arnhem Land region of Australia. It is called Our Birds. Siena developed an interest in photography around the age of 12 when she started taking photos of nature. Her aunty subsequently gave her a camera. It is this camera she takes with her on regular walks with her father, during which she keeps an eye out for birds. When she does sight one Siena says she likes to "focus in and really try and capture it in its natural beauty. "There are so many birds in Arnhem Land it is difficult to keep count," she says. "I feel like I want to spread the message to everyone throughout the world and Australia, I want to show them the special side of North-east Arnhem Land." Siena's father, Will Stubbs, is the coordinator of the Buku-Larrnggay Mulka Centre in Yirrkala who was awarded the prestigious Australia Council Visual Arts Award (Advocate) in 2015 for his outstanding work. Her mother is schoolteacher and clan Elder, Merrki Ganambarr Stubbs. Siena talks about how this book came about in an interview she did for NITV. 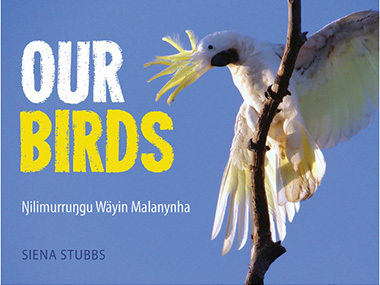 A bonus download is an audio of Siena pronouncing the bird names in Yolngu available through publisher Magabala Books. We are told that for each book sold a donation will go to the Small Seeds Big Reads: Magabala Books for Little Hands philanthrophic initiative.